Poised to be an inspired lifestyle destination for all to enjoy, One Kesas is a new trendy, next-to-go destination that promises a new dimension in lifestyle blending business needs integrated into a one-stop venue. Offering a balance of commercial and leisure elements within a comfortable ambience, One Kesas fulfils every need for patrons - all under one roof. Everyone knows that Klang is more widely known for its mouth-watering dishes and famous for its local delicacies like fresh seafood and Bak Kut Teh. At One Kesas, you will be able to taste freshly ground rich red bean pau from Tanjung Sepat every morning, including seawater fish, crab, shrimp and pearl rice with direct delivery from Sekinchan. There will be plenty of local delights to shop for and one can find these food specialities of sorts in Malaysia from Teluk Intan Heong Peah, Bidor Chicken Biscuits, Melaka dodol, pineapple tarts and many more. 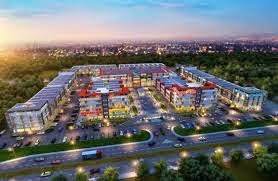 To be completed by mid-2016, this integrated commercial development covering 14.5 acres of land is strategically located and easily accessible via major highways such as KESAS Highway (from Kuala Lumpur, Cheras, Subang Jaya, Puchong and Shah Alam), Pulau Indah Highway (from Port Klang) and JalanBanting (Banting and Klang Town). With development components comprising 3 & 4-Storey Commercial Shoplots; 2-Storey Premium Shoplex,3& 4-Storey Commercial Shoplots (Alfresco Shoplots), Boulevard Shoplets, Banquet & Convention Centre, including a spacious Open & Landscaped Courtyard, One Kesas is destined to be the next-to-go life style destination in Klang Valley.